Apparently, 133 million other people may also have watched "What Does the Fox Say"
Lookin’ foxy tonight, man! Is a thing you’ll be able to say, on Halloween, to, like, millions and millions of people. In fact, one retailer reportedly says fox costume sales have risen nearly 40% since Halloween 2012. That seems low, actually, considering last year there wasn’t a fox-costume-depicting video with more than 133 million views on YouTube. But the increase is expected to grow even more. 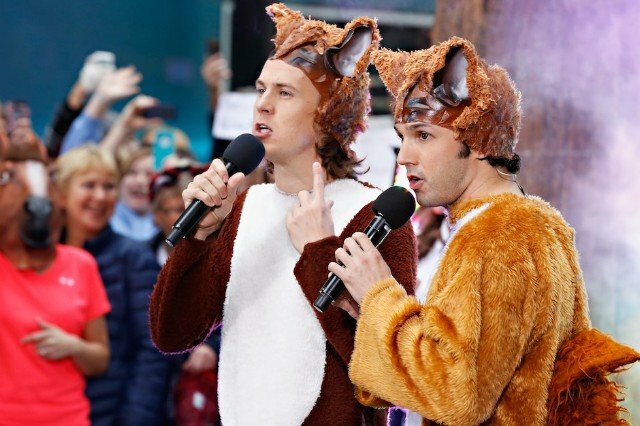 SPIN caught Ylvis on the set of NBC’s Today show — read about it in David Marchese’s feature, 120,000,000 Ylvis Fans Can’t Be Wrong. Tor Erik Hermansen of Stargate, the production duo behind the track, also told SPIN that “The Fox” is an unintentional EDM parody. And we know The Roots’ ?uestlove, who sat in on the drums and funny ending noises in Ylvis’ live music video performance for Late Night With Jimmy Fallon, already has his costume. That PSY “Gangnam Style” suit you’ve had on mothballs since last year? Hey, 2013 might be a contrarian year to bring it back. But expect some funny looks from all the foxes. Surely they’ll have something to say.